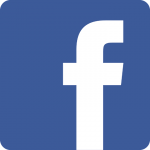 Fred Milward was born on the 16th January 1924 the second son of Ben and Rose Milward in the village Ticehurst in East Sussex, his brother John was two years older. Ben their father was a farm labourer who tended to argue with his employers and Fred’s early memories are continually moving between different farms. At the age of 10 in 1934 the family moved to Westfield in East Sussex and between then and the start of the Second World War his father worked on four different farms in the village. In 1940 at the age of 16 Fred joined the local platoon of the Home Guard (Dads Army) and had many funny experiences, including one when a German bomber crash landed in a nearby field he and three of his comrades chased after it, but when they saw four large Germans standing beside it they hid behind a hedge until the local Policeman told them to help him arrest them. Fred from a young age had an interest in flying and aviation so in late 1941 he tried to enlist in the Royal Air Force but as he was still only 17 they to come back when he was older, so he went to the recruiting office of the Royal Sussex Regiment next door and they accepted him. So, in early 1942 he joined the Army and done his basic training, later he saw they were asking for volunteers for the Glider Pilot Regiment so he applied but failed the medical because of colour blindness. 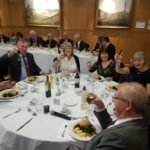 The next he saw they wanted volunteers for the newly formed Parachute Regiment which applied for and this he was accepted. In 1943 after rigorous ground training Fred was sent to Ringway (now Manchester International Airport) for his parachute training which he found very hard, he said the most difficult thing he had to was jumping out of static Balloon basically because of his fear of heights and yet he loved flying. After finishing his training, he was posted to the 9th Battalion of the Parachute Regiment and began training for the invasion of Europe. Colonel Otway the Commander of the 9th was only person in the Battalion who knew what their target was for the Invasion, they knew it was to be a gun battery as they trained to attack a mock-up of one in Hampshire. Late in the evening of the 5th of June Fred and his comrades board their Dakota aircraft ready for departure, taking off in the early of the 6th of June they headed for France. Fred was the first to jump in his aircraft so as they flew over the French coast the red light came to prepare them to jump so Fred went and stood at the door of the Dakota, soon after their aircraft was thrown about by anti-aircraft fire and he and his number two fell out of the aircraft, Fred hitting his head on the tail plane knocking off his helmet. When the two of them landed they found that they were near the planned Drop Zone could join up with Col. Otway and the other men that had landed nearby. Of the nearly 700 men of the 9th Battalion only 150 had reached the rendezvous point by time Col. Otway order the attack, Fred was ordered to attack No 1 Casemate, he saw some of his comrades being shot and wounded but managed to reach the main door of No1 Casemate, where he threw in his grenades. A Sergeant asked Fred for all the explosives he was carrying and then told him to get out. He was one of the 75 men that walked away from the attack on the Battery. Later that day the 9th attacked Le Plein capturing the Chateau St Come and dug in, they were joined other members of the Battalion who had dropped wide. Fred always said that this was the toughest part of his war fighting numerus attacks from the Germans. After a long spell of fighting the Unit was relieved for a rest. They then sent to the Bois de Bavant where on the 26th of July Fred was wounded. 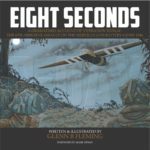 He and a comrade had jumped out of their slit trench to rescue a Spitfire pilot who had been shot down, a mortar bomb landed close to them killing his Sergeant and injuring Fred down right side. After a period in hospital he was declared unfit for active service because he was totally deaf in his right ear. 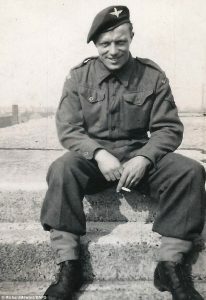 He was then given a choice of being sent back to the Barracks in England or staying in France as a guard looking after German POWs in Bayeux which is what he did. It was here that he met his future wife Connie Purvis who was a Londoner, she served in the ATS (Auxiliary Territorial Service) and was sent to France to return control to the French Civil Authorities. They met at a dance held at the local Barracks and they did a lot of their courting in Normandy and were married in November of 1945. Fred was demobbed in 1947 and took his wife back to the village of Westfield where they had their first child Richard in December of that year. He took up a job as a motor mechanic in local village garage where he worked until his retirement in the 1990s. In 1949, he and his family moved to a new home in the village where he lived until his death, vowing never to move again having spent childhood do just that. Their second child a daughter Wendy was born in 1952 completing the family. He led a very active life post war joining the Royal Air Force Volunteer Reserve and becoming the Commanding Officer of the Hastings Squadron of the ATC (Air Training Corp) so he fore filled his dream of flying and he also joined a parachute club where jumped until he had completed 50 drops including his wartime ones. He also played cricket for the village and later went on to play bowls. 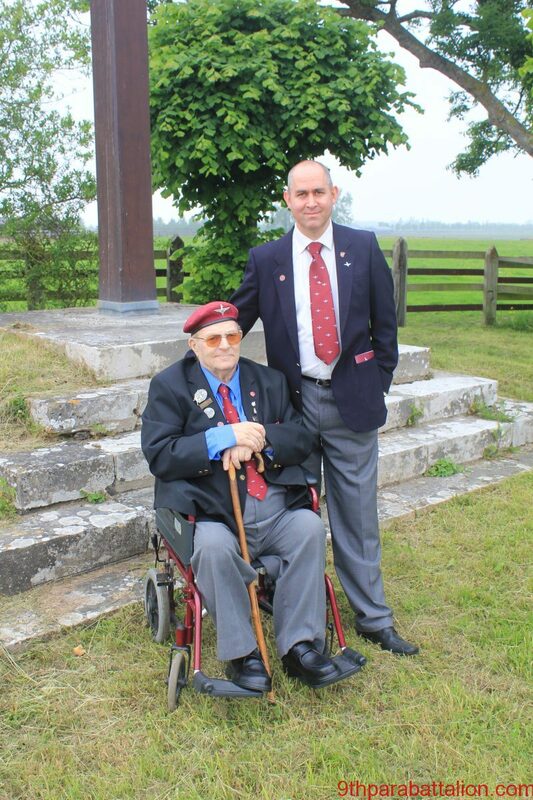 Fred Milward and Mark Otway at the Calvary Cross on D-Day 2016 – the RV point after the battery assault. 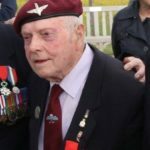 It wasn’t until the fortieth anniversary of D-Day that he told his family what he had done on that day, they had always known he was a paratrooper but nothing else. 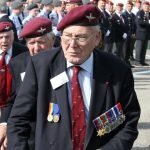 A newspaper had wanted people’s memories of D-Day and he sent his story in and they had similar story from another veteran, a national TV news broadcaster got hold of this story and bought the two men together who hadn’t seen each for over forty years. 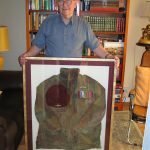 A member of the 9th Battalion Reunion Club saw the item and got in contact the two inviting them to join. 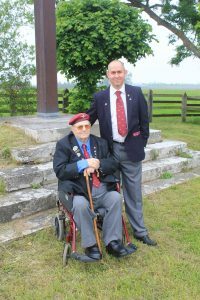 So it was in 1985 that Fred and Connie returned to Normandy for the first time bringing back very strong memories for both of them, especially for Fred when he returned to the Merville Battery and the Chateau St Come. Connie passed away in 2010 in a nursing home after a long illness with dementia and her last visit to France was in 2003 after which Fred was accompanied by his son Richard. 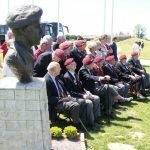 In 2016 Fred was very proud to be presented with the Legion d’Honneur by the Mayor of Merville-Franceville Olivier Paz, this was his last visit to the Battery as he became ill in 2017 and passed away on the 23rd of July.